NEW YORK—Violence can only go so far when it comes to video games, and developers are increasingly looking for ways to expand their creativity into games that benefit others or directly act to educate or foster social change. There is no better time than now, said Robin Hunicke, founder and designer at the newly hatched game developer Funomena, and best known for Journey (thatgamecompany), an artistic online adventure game that took the gaming world by storm in 2012, winning massive critical and commercial success. Journey’s creators describe it as “an interactive parable,” in which anonymous players experience the passage of one’s life and how it intersects with that of others—very different from games we usually see. Journey’s success, then, said Hunicke, tells us that we are at a time of renaissance for the creation of independently produced, socially conscious games. Such was a major theme at the annual Games for Change Festival, now in its 10th year, which brings together educators, game developers, and others interested in games that have a social impact, mostly from the United States but also from around the world. “More than any other year, it was a year where big announcements, in the space of games for learning, and games for social change, were made at the festival,” said Asi Burak, co-president of Games for Change, the group organizing the event, which took place June 17–19 in New York City. Games for Change, founded in 2004, aims to bring about social impact—humanitarian and educational—through the use of digital games. It facilitates the creation and distribution of these games. Burak had a chance to share with festival attendees what he sees as successes and failures in the three-year process of bringing the Half the Sky movement game (Frima Studio), what by many accounts is a successful “game for change,” to market. Based on Nicholas Kristof and Sheryl WuDunn’s bestseller Half the Sky: Turning Oppression into Opportunity for Women Worldwide, the game is designed so that playing the game itself, with the support of its sponsors, unlocks real-life victories like purchasing books for girls that don’t have them, and even life-changing medical interventions. Festival attendee Jorg Hofstatter is managing partner of Vienna-based Ovos Media. Hofstatter had the chance to present his game, which is in development, to a panel of esteemed game professionals. “With ‘Lebensnetz,’ we target people beyond 55, and give them the possibility the share the moments and stories of their lives, the ones they really much appreciate and want to memorize,” says Hofstatter, who said most of the effort of the development went into creating an interface that seniors would not reject outright. The other unique feature of the app is the “life net” (literal translation of Lebensnetz). It shows “the correlations between people and the events, between people and themselves, between like a photo album and a person, for example … a journey of their life,” said Hofstatter. He was able to leave the festival armed with constructive feedback to take his project into its next phase of production. Another game that was subjected to expert scrutiny was Nicole Lazzaro‘s Lux (XEOplay), which was inspired by the idea that “sometimes your emotions from disappointment interfere with you pursuing your dreams,” as Lazzaro describes it. Lux, in which a player travels through a world in decline and uses light to bring to life landscapes, is ambitiously designed to help players overcome those emotions and help them learn the power of forgiveness. Lazzaro is looking for beta testers. – Most Significant Impact: Data Dealer (Cuteacute Media OG). A game focused on data and online privacy, where the player becomes a dealer of data through transactions—collecting and selling—akin to real life. – Most Innovative: Blindside (Epicycle). The immersive 3D audio adventure was inspired by one of the creator’s experience of being temporarily blinded in a high school chemistry accident. – Best Gameplay: Reach for the Sun (Filament Games). 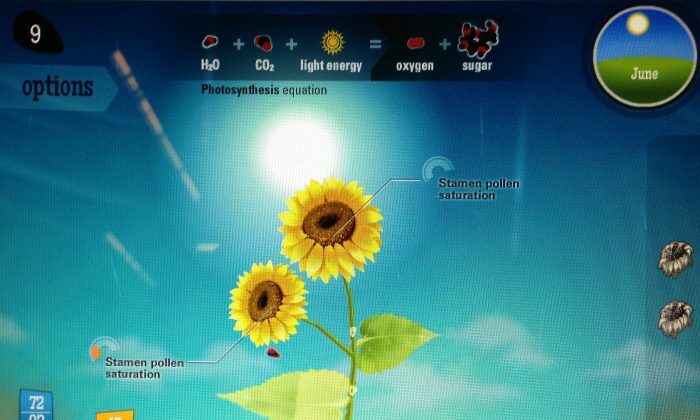 As educational as it is beautiful, the game brings the lessons of plant biology to young learners. – Game of the Year: Quandary (Learning Games Network) Players come to grips with ethical issues as they shape the future of a new society. In addition to recognizing games, a new award was created this year to honor an individual who has made significant, global contributions to the field and who inspires new generations of game creators. The first recipient of the Game Changer Award, Jesse Schell, is the CEO of Schell Games and a distinguished professor at the Entertainment Technology Center at Carnegie Mellon University. At the festival he unveiled Lexica, a game that encourages students to read more. “Forget fun, create empathy and truthfulness,” was another challenge, this one issued to game designers, by Gamasutra‘s gaming journalist Leigh Alexander. Nick Fortugno, co-founder of New York-based Playmatics, a game development studio, teaches game design and interactive narrative at Parsons New School of Design and has attended the conference from its inception. “I think the most significant milestone at this conference is the presence of multiple portals and publishers, that there’s more than one person here who’s looking at this as a way to create an ecosystem of games, because that signals that this isn’t just a bunch of one-off experiences,” he said. School shooting video game: A video uploaded to YouTube shows a "Counter-Strike" map that is a replica of a British Colombia high school. 29-story video game: A 29-story skyscraper in Philadelphia turned into a giant game of Pong on Friday.